I was packing my bags to go to another trip to a wild life sanctuary when our elder daughter walked in the room. She wanted to borrow some of my sketch pens, and without waiting for an answer grabbed them from my table and dashed to her room. Time to buy another set of markers I sighed, for anything your kids borrow never comes back. Ask my mother, who is still waiting for her suitcase she gave me about 10 years ago. Soon I could hear voices of girls of all ages in our house, nothing new I thought, in a house with 2 little girls, it is common to see their friends coming. But today the noises were a bit louder and the excitement could reach me in the other room. Let me investigate what the hulla gulla is all about, I thought. So I knocked on Princess’ room, only to be greeted with a “Go Away Pinkette” apparently the missile was targeted at the younger one. As we do not have the luxury of butler, I announced to myself. The younger one emboldened by the support from somebody taller than her sister, gave a week smile and then wailed a little louder, “they are making posters and they are not letting me in”. “Posters? What Posters”, I enquired. “What summer fun”, I was totally confused as I could not relate summer fun with tears in the eyes of our little one. 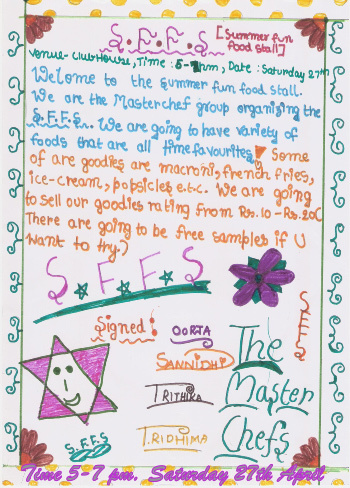 After a few knocks on the door I was able to persuade Princess to open the door and there on the floor were spread some papers in various stages of metamorphosis into a poster for Summer Food Festival Fun. Soon the mystery was unveiled. Since it is summer vacation time and most of the kids are at home, some of the girls between 7-14 in the complex have decided to organise a carnival for kids and their parents in the club house of building in which they will be selling food items loved by kids like Pasta, French fries, Pizza, cold drinks, etc. They have roped in the mothers also to help them and the posters were for that. Now since Pinkette is only 4, she was not allowed in the August Company of the 7 year and above club. Ah! Guru bhai vs. the Bombay Club I thought, this business club is also not allowing new entrants. But I was very happy at the spirit the girls have shown and immediately went to negotiations table. “Three”, pat came the reply. “About 10”, replied their leader, who also happens to be primogeniture of our family while being a girl child. You see the English crown is only copying what I and my wife agreed a decade ago. Any ways I digress as always. “Ok if I give you photocopies of the 3 you have made will you let Pinkette join you, this will save you a lot of time?” I threw in an incentive to let the younger one in gang. “OK, papa let me talk to my friends and come back to you in 2 minutes”... being my daughter she is not an easy one to give up. In the mean time the younger one started crying again as she has not heard the words she has been wailing…, oh I mean, waiting for. “Ok”, I agreed, smiling at the smartness of these young girls, who have not only planned a Fun fest in the apartment complex but are diligently working to make it a success, and also showing excellent negotiations skills. So dear reader, if you are in Hyderabad on 27th of this month, please ping me and join the food stalls owned and operated by budding entrepreneurs and business leaders, our next generation of Kiran Majumdars, Anu Agas, Chanda Kochars, and Shikha Sharmas.